I had a reader who was recently appointed the responsibility of creating the annual church budget. 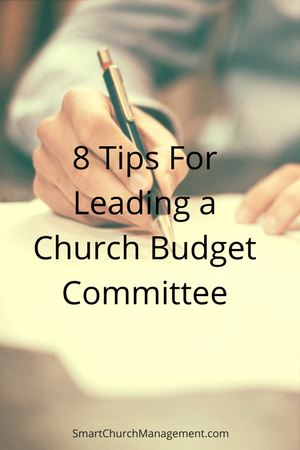 She asked for help in creating a meeting agenda, preparing to lead the church budget meeting and tips for keeping the group moving forward. Leading a budget team meeting can be a fun and productive experience. The secret is being prepared. There is a lot more to leading a budget meeting than meeting with a team. It involves skillful meeting facilitation, understanding group dynamics and the ability to hold people accountable for job assignments. Gather all historical budget data from your church accounting system and create handouts for the church budget team to review. Make sure the information is in an easy to understand format and that complex accounting terms are translated for clear understanding. Most people are uncomfortable asking terminology questions. Particularly if they have been asked to serve on such a prominent committee. Help them by making the data easy to understand. Most people want to follow a leader who cares for them as individuals. Take the time to schedule the meeting around their availability and you will be demonstrating that care. Schedule the budget meeting by providing several date/time choices for the committee members. The goal is to give them date/time options so they feel like they have a say. Work with them on their time availability to make them feel valued. This simple step will give you credibility while you begin to gain their trust for you as a leader. Now having said that, there are always other variables that need to be considered that may limit date/time option. For instance a busy church may have limited meeting space. Create an agenda based on the expectations that you have been given for the team. An agenda is merely a tool to help the team stay on task for what needs to be discussed and accomplished. When setting an agenda try to anticipate how long each agenda item will take and schedule that amount of time for that meeting point. There is no easy way to do this but it is important to have a guide to help you through the meeting so you don’t get 90 minutes into the session and realize that you are still on the first point of the agenda. As you facilitate the meeting make sure everyone on the team participates in the discussion and try to make sure there is consensus on any decisions. This sometimes involves letting everyone voice their opinions and letting the group come to agreement on the best answer with all ideas considered. Make sure the meeting starts and stops on time. This will give you credibility as a leader for being respectful of the time of others. Assign someone to take meeting notes and someone to watch the clock. This will provide a record of the discussion (what decisions were made, who is doing what, etc) and keep the group to the scheduled time. These are basic meeting ground rules but you can also ask the group to add any other “rules” for behavior that they think is important. The trick to team success is allowing the group to bond as a group. Group dynamics can make or break a team so spend time to allow the team to bond. This sometimes takes a few meetings to get the synergy going. Do this by allowing a bit of ‘social’ time before and after the meeting to help with relationship building. When team members are in a relationship with each other they tend to trust each other – which results in a more cohesive and productive group. At the end of each meeting talk about next steps and assign or ask for volunteers to complete projects/tasks before the next meeting. Have the note taker document these assignments in the meeting notes. A few days before the next meeting send out a meeting reminder and include those things that committee members were responsible to do and let them know that they will be asked to report on the progress of their assignment. Create the next meeting agenda based on team assignments and start the next meeting by reviewing notes and then go down the list of assignment reporting. The major pitfalls for most committees is either team conflict or getting stuck. To avoid these, help the team develop as a group and hold people accountable for their assigned responsibilities each week (or however often the group meets). Open the meeting with your personal expectations of the group and make it clear about those things you will not be able to tolerate (for the sake of the committee responsibilities) and if people aren’t committed to fulfilling their job assignments they may need to be replaced. It’s kind of like the first day of school, the teacher sets the expectations just to get everyone on the same page. As you finalize budget proposals make sure the team objectively thinks through any and all questions that might be asked. You want to think of everything before presenting a preliminary budget. The last thing you want is to be presenting a budget and get asked a question that you do not have a good answer for. Spend time trying to shoot holes in the budget so that you can anticipate questions before they are asked. For instance, if the budget includes resources for a major building expansion, make sure you have the data to justify the need. Leading any kind of team can be fun and rewarding but taking the time to plan is a critical first step. If your team has been meeting for a significant period of time and gets stuck in a rut, it may be time to appoint a new leader or shuffle some of the members around. New perspectives always bring fresh insights into a group and what more important group can there be in a church than the Church Budget Committee!